Car manufacturers are being innovative with their vehicles to provide a more comfortable and exceptional driving experience. While manufacturers used to put more focus on speed and design, we have seen a lot of attention given to the car entertainment system. The increased demand for luxury and entertainment has forced many car makers to equip their new vehicles with top of the line audio/video gear. Since many car enthusiasts aren’t satisfied with their factory sound system, many of them end up upgrading and customizing it for better sound quality. This used be a common practice for many of us. With the increased technology, manufactures started to incorporate all the needed gear for an optimal sound performance and enjoyment. This will take a lot of burden on many car owners to install and upgrade their car sound system. Have you taken a close look at the new 2011 Scion tC? This budget friendly vehicle is loaded with outstanding interior upgrades that make it the best fit for many of us including enthusiasts. If you think that the 6 speakers you have in your old car is enough, you will be thrilled by number of speakers this incredible car has. The door panels (rear and passenger sides) were re-designed to fit 8 powerful speakers that are capable of pushing 300 watts of continues power. 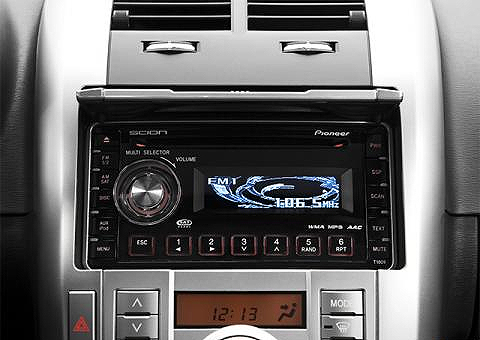 The Scion tC is also equipped with a pioneer headunit that will meet all your entertainment needs. This headunit can pump 160 watts of power with an easy to access USB and iPod input slots. For those who love bass, they will be able to add their own subwoofers very easily with minimal system modification. If you are looking for edgier and faster cars, they will find the new Camaro a great fit to satisfy their music and speed needs. This muscle car is loaded with 9 Boston Acoustics premium speakers which can handle up to 245 watts of power. With these speakers, you won’t miss anything. This car is also equipped with a Hand-free Bluetooth technology to let you make and receive phone calls from a press of a button. You can also connect your iPod to the audio system or hook your USB drive in seconds. For those that want a commercial free music, they will find the XM radio ready feature very useful. What does this mean to the buyer? Today’s cars are loaded with the latest audio technology needed for the optimal driving experience. That being said, the customer will end up paying extra money for these crazy features. For those that are on budget, they can buy aftermarket audio gear to increase listening pleasure without paying premiums for it. You need to be savvy enough to install these products yourself to prevent paying a professional installer to do the work for you.